An Aussie. An actor. A rocker. A rowdy. A noted student of the laws of physics as they pertain to the momentum of a thrown telephone. Not exactly a recipe for a kindly father figure, you’d think. 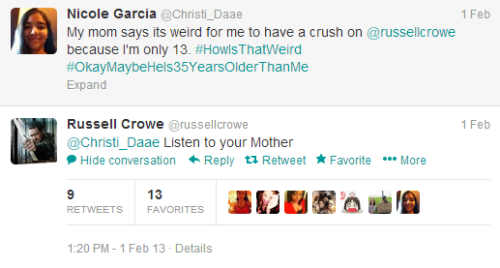 To everyone’s surprise, you’d be wrong, at least if you were thinking of Russell Crowe. Thirteen-year-old Texas superfan Nicole Garcia was tweeting at and about her favorite celebrities one day (Crowe, Benedict Cumberbatch, Matt Smith, and the list goes on) when, to her surprise and amazement, one of them tweeted back. To everyone’s surprise and amazement, the exchange was perfectly adorable, and we give it here. @russellcrowe gotta say, never cared for you until JUST NOW. That was awesome. The Twitter exchange was screencapped and posted to Tumblr, where it received 127,052 reblogs, likes, and comments, although the original post has now been deleted. In case you’re wondering, she DID do her homework. 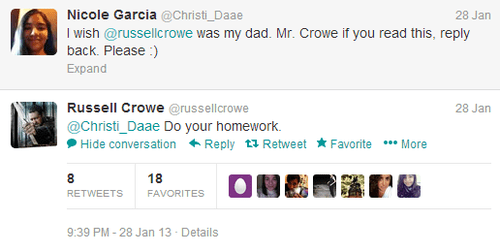 Russell Crowe, your work here is done! @russellcrowe I'm doing my math homework. Gosh, stop yelling. This entry was posted in Celebrity, children, Culture, humor, Humour, kids, Twitter, Weird. Bookmark the permalink. Yes, exactly. Not exactly what you’d expect from the man, but very cool.